London (AFP) – Britain’s Ahmadiyya Muslim community on Friday held a “Prayers for Paris” interfaith event at their grand mosque in south London, the giant building still scorched from a suspected arson attack two months ago. The small community has more to fear from extremism than most — the Ahmadiyya sect is denounced as heretical by hardline Islamic scholars and its adherents are legally “non-Muslims” in Pakistan, where most Ahmadis live. 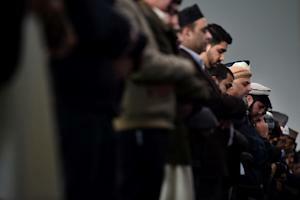 Despite its small size, Britain’s Ahmadi Muslim community has been highly vocal in denouncing last week’s attacks in Paris, and gathered local religious leaders to hold prayers for the jihadist assault’s 130 victims. “It was a tragic event, and now we all stand united, here today to pay our respects to the victims,” said Ahmadiyya national leader Rafiq Hayat, flanked by local councillors, Christian clergy, a member of parliament and a police official. Large banners featuring the French flag had been fastened to the Baitul Futuh mosque’s outer walls. After Friday prayers in the vast mosque, which the Ahmadis say is western Europe’s largest, some 500 worshippers listened to a message from the community’s worldwide leader, or Khalifa, Hadhrat Mirza Masroor Ahmad, who was travelling abroad. The 10,500 capacity, 5.2-acre (2.1-hectare) mosque complex was completed in 2003 and the motto “Love for all, hatred for none” is emblazoned on its walls. “I would like to reiterate that all forms of terrorism and extremism are completely against the teachings of Islam,” Ahmad said in his message. The sect was founded in 1889 in India by Hadhrat Mirza Ghulam Ahmad, and has since grown rapidly, with a strong missionary drive and an estimated 10 million followers worldwide. Only around 30,000 of Britain’s roughly three million Muslims are Ahmadi, and many suffer persecution and physical violence abroad. In Britain, a teenager is still on bail after being arrested on suspicion of arson following the September blaze at the Ahmadi London mosque, although police say there are no indications of a hate crime. The Muslim Council of Britain (MCB), an umbrella organisation, has also denounced the Paris attacks, taking out an advert in national newspapers. “When a bomb is blasted or people are attacked in the street, there’s no discrimination whether the victims are Muslim, Ahmadiyya Muslim, or any Muslim of any type,” Hayat told AFP.